Earthworms and … climate change? 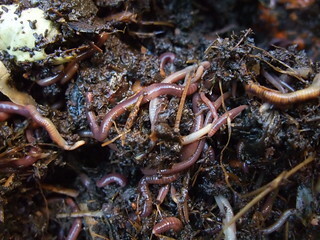 As any gardener will tell you, earthworms are good for your garden. However, that same ability to compost organic material into rich, black soil in your backyard may actually be having a detrimental impact on some forests, and in turn, carbon storage. Earthworms, you see, are not native to the province of Alberta in Canada. Indeed, apparently most of Canada’s native earthworms died out during the last ice age; the worms you see today are likely invasive species that somehow made their way across the ocean with European immigrants. Earthworms eat will eat copious amounts of leaf litter on the forest floor, and this speeds up soil decomposition. It’s not yet clear how this affects the growth cycles of trees, forest plants, and the birds, mammals and invertebrates that live in forests where worms have not been found before. So how does climate change come into it? Leaf litter, as it accumulates in forest soil, works like a carbon dioxide bank, storing it underground. So scientists now want to know if earthworms reduce carbon storage, and if so by how much? Initial research by Dr. Erin Cameron suggests that it might be as much as a 37% decrease; this could have a significant impact on climate change. Given this data, the Alberta Worm Invasion Project has a mandate to slow the spread of earthworms in Alberta. As you might suspect, human activity is still a major cause of accelerated earthworm spread, as worm eggs can cling to car tires, and fishers tend to dump their bait at the end of a day out fishing. The project has a public awareness campaign going to help reduce the impact of human activity. On the citizen science side, the Worm Invasion Project wants your help to track the spread of earthworms in Alberta. The Worm Tracker is an iOS app that allows you to track where and when you find earthworms in the province. There’s a field guide to help you identify species, and you can use Google Earth to explore some of the data. If you own a pool, you know that keeping the water clean and free of leaves and insects is an ongoing battle. The good news is that if you live in New York state you can turn that chore into data for science. The state’s Department of Environmental Conservation wants you to keep tabs on the Asian longhorned beetle by monitoring your pool filter for the little critters. The DEC wants you to check your filter at least weekly from now until August 30, and if you find one (or more), snap a picture and email it to foresthealth@gw.dec.state.ny.us. Once you’ve sent the picture in, you’re asked to put the bug(s) in a container in the freezer until you receive instructions to either discard the container or send it to the DEC. 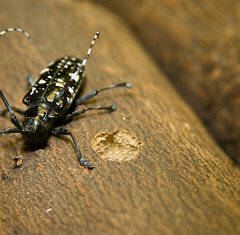 The Asian longhorned beetle is an exotic “invasive species,” and a major infestation may well devastate the local tree cover. With everyone involved in looking for the beetle, there is a better chance of finding new infestations early, which in turn will allow the DEC to implement control measures more quickly. Don’t have a pool? No problem; the DEC still wants to hear from you if you think you’ve found some.